Is Antigravity the Fifth Fundamental Force of Nature? 1. The static idea of Gravity. I think that gravitational fields are cyclically variable, they expand and contract with different frequencies and phases of variation depending on the elemental mass which interact with the gravitational field producing its cyclically variable curvature. 2. The idea that atomic nucleus are placed inside of atomic masses. I think that atomic nucleuses are placed in the electromagnetic field created by the mutual intersection of (at least) two gravitational fields. The spatial movements of this electromagnetic field (movements produced by the gravitational fluctuations of both entangled fields) cause different pressure forces inside and outside of this atomic nucleus. But the atomic nucleus is the electromagnetic field itself. And It is the “chemical bond” too. The known elemental forces of nature have been measured inside and outside of the shared atomic nucleus and inside of each gravitational field. But outside, at the external side of the gravitational intersection of those entangled gravitational fields, there is another inverted spaces that can be considered as an anti-nucleus. And its downward movements (oposite with respect to the upward movements of the nucleus) create a downward pressure force which has an opposite direction with respect to the gravitational fluxes that creates those gravitational fields. This anti-nucleus creates an anti-photon that represents an anti-gravitational force of pressure. 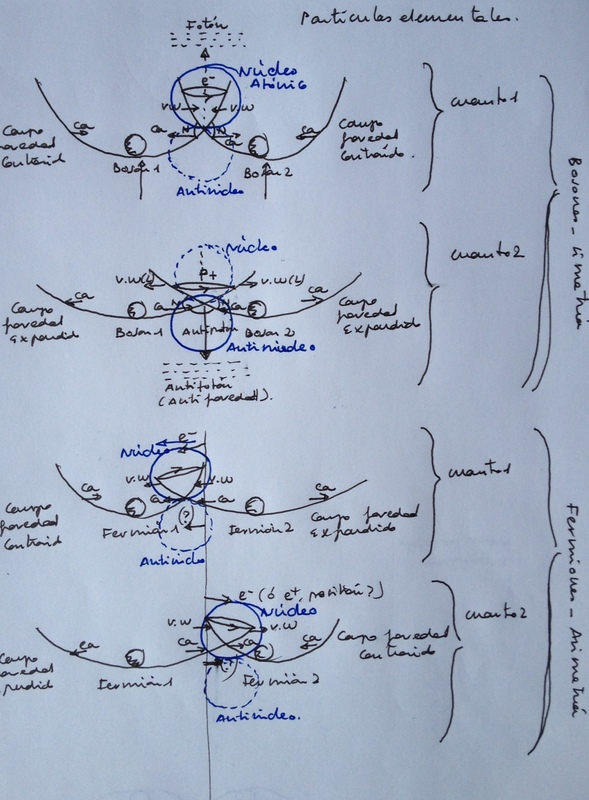 I have drawn a general picture taken consideration the different gravitational phases of variation that I think exist between “bosons” (equal phases) and fermions (different phases). The upward and downward alternate and opposite movements of the nucleus and the anti-nucleus are produce by the cyclical and successive variations of the entangled gravitational fields. « Fuerzas de Van der Waals y Fuerzas de Casimir. Su relación con la Gravedad.